In order to reach our potential, we must be intentional about how personal growth really works and how we can develop ourselves to become the effective and fulfilled leaders we are meant to be! Caz loves to inspire, motivate and challenge audiences with humor. Discover how these workshops can develop the leadership skills of your managers, supervisors, leaders and employees! The relationship between Caz and Chilli is fun, inspiring, and shows leadership in action. Caz Russell is an independent John Maxwell Leadership speaker, teacher, trainer & coach. Inc. Magazine voted John Maxwell as the #1 leadership and management expert in the world! 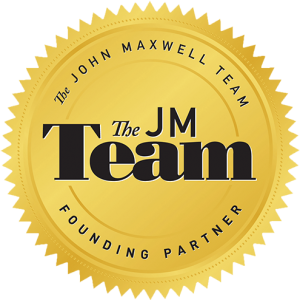 John Maxwell’s team is the most sought after group of coaches, trainers, and professional speakers. Caz has learned from the #1 Leadership Guru. Take advantage of 40+ years of proven leadership curriculum passed from John Maxwell to Caz and be equipped with the very best leadership skills, tools, and resources to make you more successful in life and business. Learn more at my John Maxwell Team Member page.